click on the 'more' link. The more social networking sites I join, the more notification messages I receive. It's an annoying fact of life. At one point I was so inundated that I actually unsubscribed myself from receiving email notifications from all of the services I use. It worked for a while but then I started to miss stuff. Messages would sit unread. Friends' birthdays would come and go. Opportunities would pass me by. Then I realized the power of Gmail. 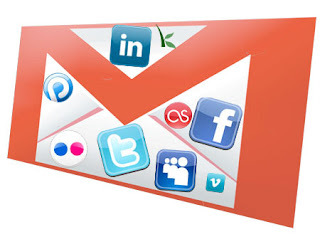 In just a few steps I was able to make a colorful, organized, functional social networking inbox by making use of Gmail's features. Gmail's label feature is a fun, colorful way to categorize your social networking accounts. My recommendation is to assign a color that closely matches the site's logo or color scheme. Create a label for each and every service you use. If you're concerned about overkill or clutter, don't worry. I'll explain later. In order to keep your inbox neat and clean, you'll want to have all of your social notifications bypass it and get filed away for later viewing. This is probably the most time-consuming step, but also the most rewarding. In Gmail, click on 'Create a Filter'. Select 'Skip the Inbox (Archive It)' so the notifications never get mixed in with your regular email. Click 'Apply the Label' and select the service from the drop-down menu. This will automatically categorize the notification as it is received. Check 'Also apply to __ conversations.' This will assign the label to past notifications. In Gmail, click on the little green labs icon up top. Scroll down to 'Hide Read Labels'. Click 'Enable' and then 'Save Changes'. Once setup is complete, you have a fully functional, non-intrusive alert system - much like the way Google Buzz works. Your email remains untouched and your online social life is neatly tucked into the side bar. This is by far the most extensive, customizable approach to managing multiple social networking profiles that I have come across. If this setup process seems like too much of a hassle, definitely check out some of the popular lifestreaming applications like Seesmic, Hootsuite, and Tweetdeck. However, keep in mind that these applications only support a handful of social networking sites and functionality is very limited (particularly with larger services like Facebook and LinkedIn). OMG...I totally dig this and it is SOOOO NOT complicated...One of the reasons that I "migrated" to Gmail is specifically because of the filterabilities. I have done this on all of my various accounts and it is the MOST WONDERFUL thing in the Gworld....and now with the addition of the Priority Inbox....there is very little clutter to have to deal with at all. Right on sister! I've been looking for a solution like this and it was sitting right under my nose. It sure beats launching another web site/desktop application. I actually prefer Gmail than any other email platforms out there. I find it fast and easy to use. You can definitely consider it as your universal social networking inbox. I agree. Gmail has a stronger filtering system that filters spam and other anonymous emails accordingly. Anyway, I've been using several networking sites for quite some time now, and I always turn off the email notifications to prevent receiving bunch of emails.